Dixie might be the most popular teacher in the South Side Bee Branch School District, but she’s not your typical educator. 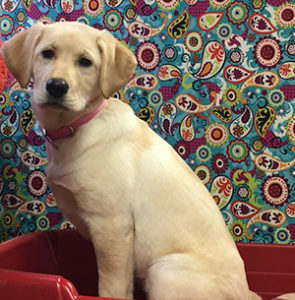 As the school district’s newest therapy dog, she is helping co-teach lessons from the Mutt-i-grees Curriculum to students in preschool through twelfth grade. But that’s not all. 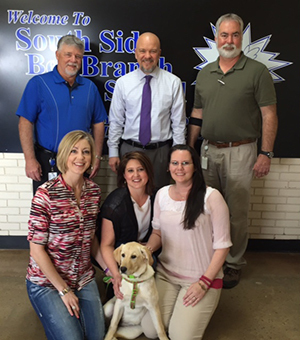 The loveable pup is also making an impactful difference in the lives of the educators and students she works with. The small rural school district located in Van Buren County, AR has been using the Mutt-i-grees Curriculum for more than five years, beginning as one of the original pilot sites for the lessons in 2009. Despite the district’s small size, Mutt-i-grees has had a big impact on this community. Students and educators from South Side have truly embraced the program, spreading the message of empathy and compassion beyond the school walls. Dixie, who assists elementary school counselor Tonya Lovell, spends her day traveling throughout all the buildings on campus. She visits elementary classrooms for whole group instruction and then sees individual students. Her duties also include being available to students who ask for her during hard days. If someone needs her, South Side educators text each other to find out where she is, and then get her to that student. Dixie usually ends her day at the buses where she gets many hugs and pets. Dixie hard at work as school counselor to elementary, junior high, and high school students at South Side. Students have begun asking for Dixie when they’re having a particularly rough day. Tonya notes many circumstances where a student is having a meltdown or is sad over the loss of a family member, and they are immediately drawn to Dixie. She always asks students if they think some time with Dixie would help, and the answer is always yes. Dixie serves as a living example of unconditional love and devotion. She offers the perfect model of a good friend and getting to spend time with her sometimes acts as motivation for students to work harder and cooperate with one another. “I have witnessed teenage girls, who normally do not get along, communicate about taking care of Dixie for a class period. Several of my hard-to-motivate students work hard every week so that earn one on one time with Dixie,” explains Tonya. Tonya also uses Dixie as an example when teaching younger students about manners. The students see that she has to learn to listen and behave appropriately, just as they do, and many often ask to see Dixie’s latest tricks. She has also taught Tonya about patience. “When I walk down the hallway with Dixie, I’m reminded to slow down and be present with each student that we encounter,” she says.